Though bats are important pollinators as well as insect-eaters, these nocturnal mammals can be dangerous. That’s because they carry in their bodies hundreds of viruses that can harm humans. Once these pathogens infect humans, the result can be death due to deadly diseases like Ebola. Below are 5 of the deadliest diseases spread by bats. In 2014, during the deadliest outbreak of Ebola in human history, thousands of West Africans as well as individuals of other nationalities died from Ebola. And who was the culprit in the transmission of this deadly disease? Wild animals that included the fruit bat species. Once an individual consumes the flesh of an infected animal – “bushmeat” — or comes into contact with the body fluids of infected humans, symptoms of the disease will begin to occur. This includes headaches, sudden high fever, extreme fatigue, severe vomiting, loss of appetite, diarrhea. If early treatment does not occur, the symptoms can eventually lead to internal and external bleeding as well as death. Some strains of the virus are said to be so deadly that up to 90% of its victims die once they are infected. Another fatal disease spread by bats is rabies. This disease can be spread by any rabid animal, including infected bats, foxes, dogs, raccoons and skunks. A person can be exposed to rabies by coming into contact with saliva from the infected animal, usually through a bite. Once you’ve been bitten by a rabid bat, you’ll need to get a vaccine called a post-exposure prophylaxis (PEP). But this will need to be done soon after the bite occur as once the symptoms of rabies begin to manifest themselves, the disease will almost surely lead to death. This bat-borne disease affects both horses and humans. Hendra virus (HeV) thus far has affected individuals residing on the east coast of Australia. 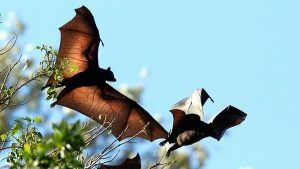 Fruit bats from the Pteropodidae family, commonly called flying foxes, are said to be the host of the Hendra virus. Symptoms of the disease are similar to influenza but it can also result in death due to respiratory or neurologic complications. Currently, there are no vaccines so treatment is restricted to supportive care involving the use of invasive monitoring to detect and provide solutions for ailments. Outbreaks of the Nipah virus (NiV) has thus far affected the region of Asia, specifically in countries like Malaysia, Singapore and India. Like Hendra, the disease results in severe respiratory and neurologic disease in humans, this time due to contact with the host of the disease – not surprisingly, fruit bats – or pigs the fruit bats infect. The first symptoms and signs of the disease usually occur within a few days of infection. They include fever, mental confusion, headache and drowsiness. It can also progress into a coma within 48 hours. That’s how serious this disease can get! In the first outbreak identified in 1999, 300 cases of NiV infection were reported with 100 deaths according to the Centers for Disease Control and Prevention (CDA). Marburg virus disease (MVD) is caused by the same family of viruses as Ebola. This disease is just as deadly and was first discovered in 1967 when epidemics in places like Germany and Yugoslavia occurred as a result of imported monkeys that were infected in Uganda. 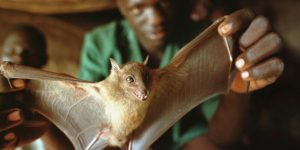 Scientists believe fruit bats from Uganda are the natural host of this disease. Like Ebola, Marburg virus disease can kill up to 90% of individuals infected. This disease causes severe symptoms that include headaches and hemorrhaging which can result in death. Individuals may contract the disease if they handle ill or dead fruit bats infected with the disease. Once they are infected, others can get the disease by coming into contact with an infected individual or body fluids such as blood or saliva. Reduce your risks of falling victim to these deadly diseases by bat-proofing your home. Use chimney caps and windows screens and caulk openings that could provide entrance to smaller bats. If you see signs of bats in your home such as bat droppings, also known as bat guano, consult wildlife pest control specialists. They will be equipped to control infestation without causing serious harm to these animals.